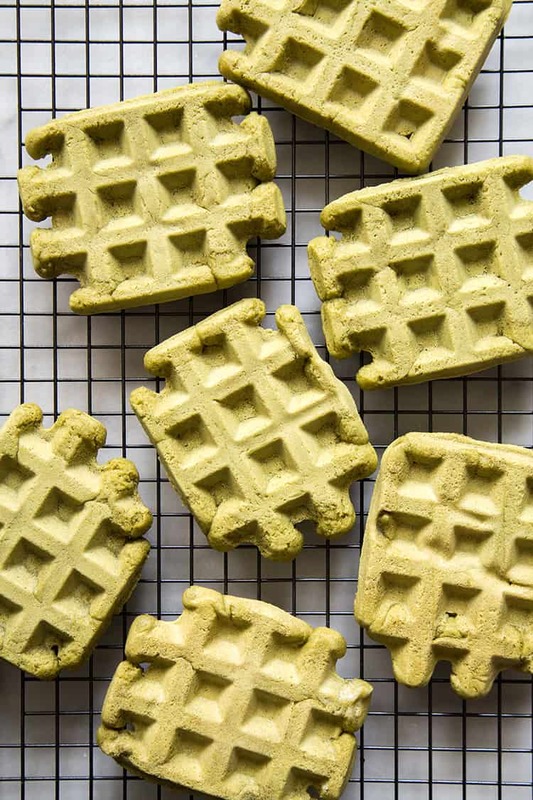 These matcha mochi waffles are crispy on the outside, yet chewy on the inside. They’re best enjoyed fresh from the waffle maker while they’re still warm. Today we’re celebrating Sarah of Snixy Kitchen and her #cheesebabygirl! 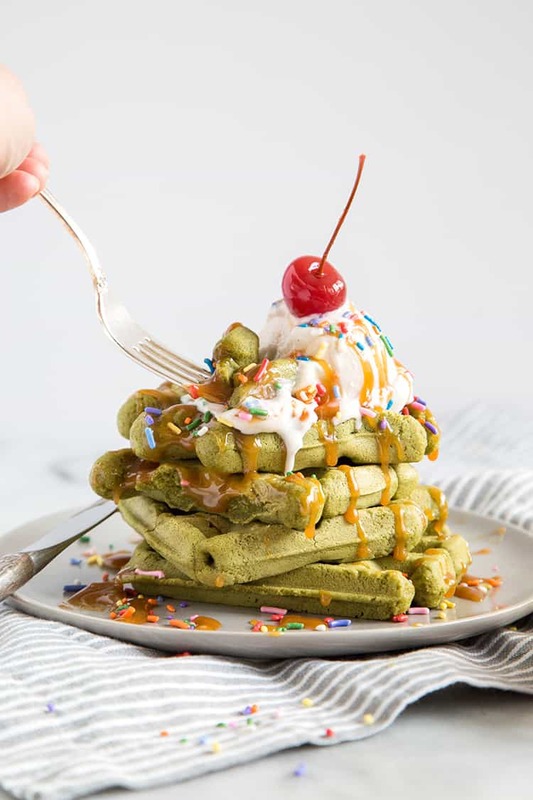 It’s a party and I’m sharing this matcha mochi waffles sundae. 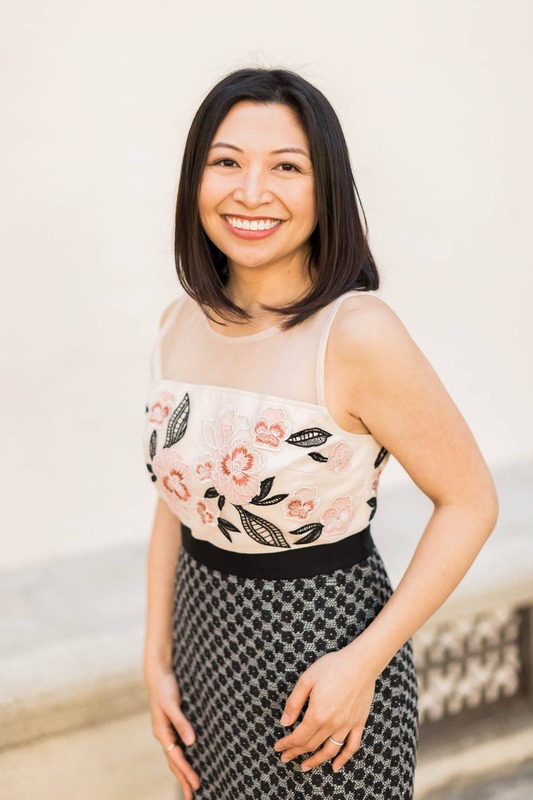 I had the pleasure of meeting Sarah two years ago at BlogHer in San Jose. Within seconds of talking to her, I immediately knew we’d become friends. We bonded over our love of matcha. We exchanged stories about our travels and food adventures in Japan and Taiwan. Sarah talked about cats and I about dogs. Sarah is one of those people that make you so comfortable and at ease that it feels like you’ve know each other forever. She’s so sweet, kind, and so unbelievably helpful and thoughtful. I’m certain #cheesebabygirl will have all these wonderful qualities and more. The theme of #cheesebabygirl shower is cheese and sweets (Sarah’s favorites!). Being lactose-intolerant, I don’t venture much with cheese. Sweets, however, is my forte. One gluten-free flour I do have plenty of experience with: sweet rice flour. I thought about making mochi or steamed rice cake, until I remembered Lady and Pups’ amazing looking molten truffles mochiffles. Unlike your traditional waffles, these need no maple syrup. Although it’s not very sweet, these waffles taste great simply on their own. But since we’re celebrating…we’re turning these mochi waffles into a sundae! 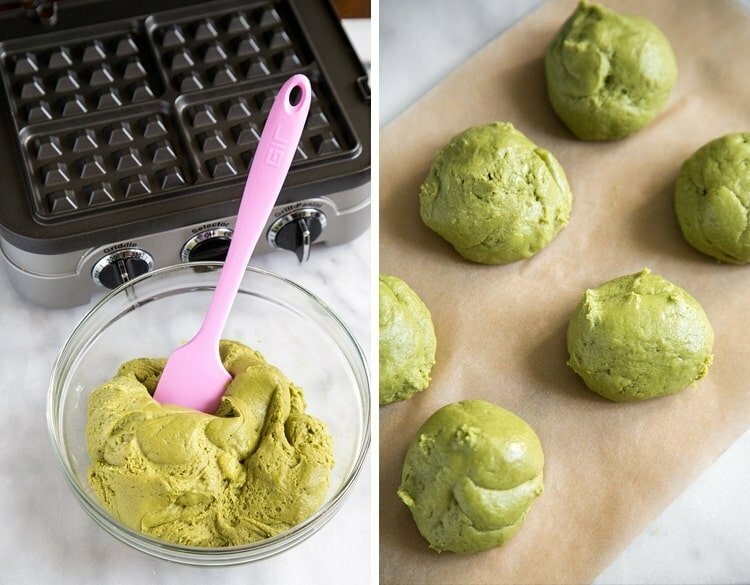 Add a scoop of ice cream (vanilla or matcha! ), a drizzle of caramel sauce, a handful of sprinkles, and a cherry on top! Congratulations Sarah and Lucas! We’re all so excited and happy for you. 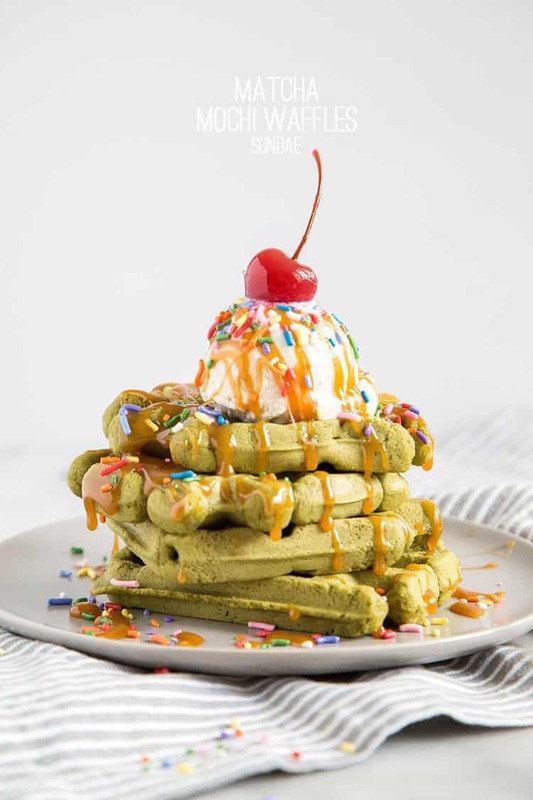 Until #cheesebabygirl’s arrival, let’s eat all the matcha mochi waffle sundaes! Stir together 1/4 cup sweet rice flour and 1/4 cup whole milk in a microwave safe bowl. Heat in the microwave for 60-90 seconds in intervals of 20 seconds. Stir contents together between each interval. The resulting mixture should come together to form a white sticky dough. Let cool for about 3 minutes. Transfer dough to the bowl of a stand mixer. In a medium bowl, combine remaining 1/2 cup milk, vanilla, egg, and butter. Add to stand mixer. Using a paddle attachment, mix on low speed. In another bowl, whisk together remaining sweet rice flour, sugar, matcha powder, baking powder, and salt. Add to mixing bowl and continue to mix on low speed until combine. Increase speed to medium and mix until smooth. Dough will be thick and sticky. Divide dough into 1/4 cup portions. Preheat waffle iron/griddle to medium-high. Lightly coat waffle iron with non-stick spray. Add portioned dough and firmly close lid. Cook for 6 minutes. When you open the griddle, the waffles will feel soft. Remove and transfer to a wire rack to cool. Let cool for one minute. During this time the waffle will stiffen and crisp up. Repeat with remaining dough. Eat immediately while waffle is still warm. The exterior will be crisp while the inside will be chewy like mochi. 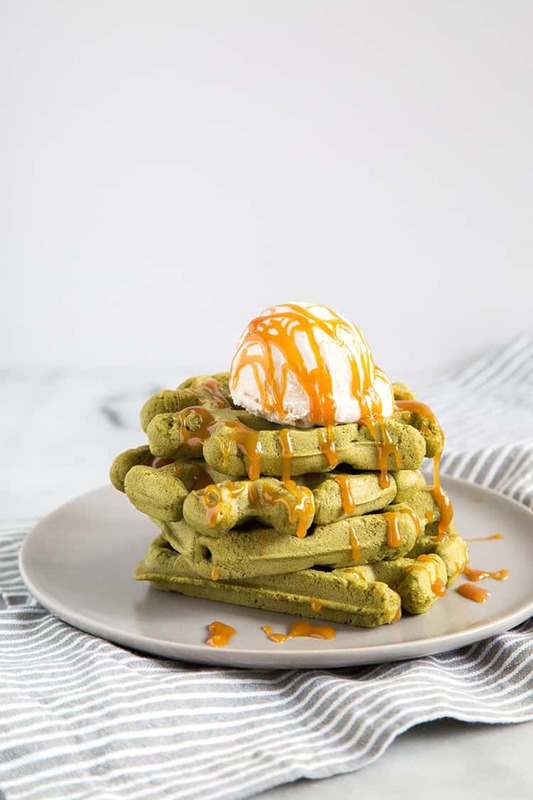 To assemble: stack waffles, add a scoop of ice cream (vanilla or matcha! ), a drizzle of caramel sauce, generously add sprinkles, and top with a cherry. Thank you Alanna of Bonjon Gourmet and Todd of Honestly Yum for putting together is fabulous shower. Join the party and check out the other recipes being shared in honor of #cheesebabygirl! This recipe is such a great twist on your traditional waffles! The ice cream and sprinkles are just what every baby girl needs! Maryanne – you have no idea how perfect this recipe is for me. I’ve had mochi waffles on my to-do list ever since we ate a green tea mochi waffle sundae in Japan (Look!) . I’ve been DREAMING about that texture – omg the texture. And now I have to stop everything I’m doing to make these pronto. I can’t believe it’s been two years since we met! Thank you so much for making the most perfect dessert ever for this surprise cheesebabyshower – I think she’s doing a lil’ dance inside me right now over these. What a wonderful way to celebrate the gorgeous Sarah and Cheesebaby Girl! 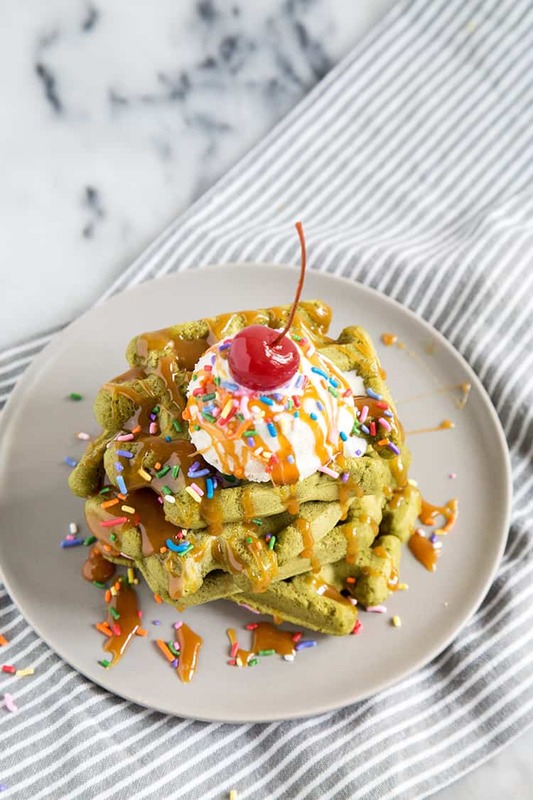 These sweet waffles look like a delightful treat for breakfast, and I know how much Sarah loves her matcha after reading her blog! I can’t wait to try these at home soon! 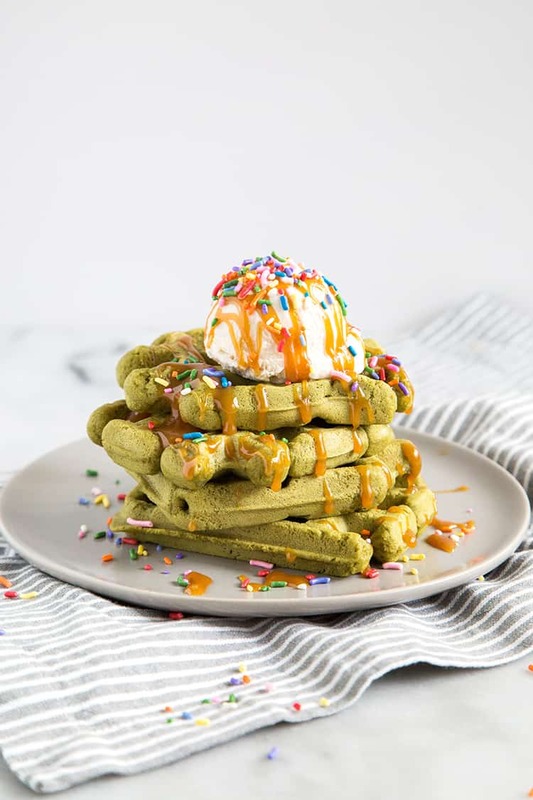 Matcha mochi waffles? These sound exactly up Sarah’s alley! And I’m so tempted to bake these right this moment because they look amazing! What a fun recipe!! This would be a good way to celebrate a birthday! This looks heavenly…Thanks for sharing Maryanne! Cheese and sweets is an interesting mix! And this sundae looks so yummy. And pretty! Since there is waffles in this, it is totally okay for me to have this sundae for breakfast, right? ;) They look fabulous! These look fabulous!! And congrats to Sarah!! Neeed. i love all things matcha.. and mochi. Where has this been all my life?! Maryanne, these waffles look beautiful! I know that Sarah loves mochi, and I love that you waffled them up!! Perfect for Sarah’s shower! How terrible is it that I’ve never had mochi!? I feel like I’m so missing out, because these waffles are blowing my mind right now. Thanks! Honestly, I’m not sure why it didn’t brown in the waffle iron. Browning is usually caused by a mixture of fat and sugars. I used non-stick coconut oil to grease the waffle iron.